Chairman, Department of Surgery, Hemet Valley Medical Center, Inc.
Chairman, Orthopedic Department, Hemet Community Medical Group, Inc.
Chairman, Orthopedic Department, APEX Healthcare Medical Center, Inc.
Dr. Kali Pradip Chaudhuri, the Chairman and Founder of the KPC Group of Companies, has reached an unprecedented level of success through extraordinary vision, acute entrepreneurial spirit and relentless hard work. The KPC Group is engaged in numerous businesses around the world serving diverse industries such as healthcare services and facilities, pharmaceutical and biotechnology, education, real estate, infrastructure development, agriculture, architecture and engineering, alternative energy, waste management, travel services and information technology. Dr. Chaudhuri completed his intermediate science at the MC College in Sylhet. He obtained his MBBS degree in Kolkata and was also educated in Malaysia, England, Canada and the United States. 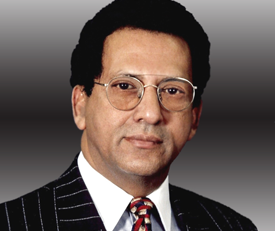 Having earned extraordinary credentials and prestigious honors, Dr. Chaudhuri has practiced orthopedic surgery since 1982. He is certified by the American Board of Orthopedic Surgeons. In addition, Dr. Chaudhuri is a Fellow of the American Academy of Orthopedic Surgeons, and a Fellow of the American College of Surgeons. Dr. Chaudhuri diversified his quest for progress in many business verticals while enhancing his footprint in the healthcare services and facilities industry. During the last four months of 2010, Dr. Chaudhuri and his group acquired a $70 million note on four hospitals in California including Western Medical Center in Santa Ana, Western Medical Center in Anaheim, Chapman Medical Center and Coastal Communities Hospital in Orange County. In addition, Dr. Chaudhuri successfully acquired two hospitals: Hemet Valley Medical Center and Menifee Valley Medical Center for $172 million. His latest hospital acquisition includes Victor Valley Community Hospital in Victorville, California. A real estate entrepreneur with widely diversified property acquisitions worldwide, Dr. Chaudhuri has enhanced his footprint significantly over the last several years. The KPC Group has been contracted to execute the prestigious “City of Corona Redevelopment” project – worth $ 1.8 billion over a period of several years. The Group has acquired the multi-million dollar high profile 300,000 SF commercial complex in Corona, California and named it KPC Summit. In addition, Dr. Chaudhuri and his group are currently engaged in the development and construction of more than 3.3 million sq. ft. of commercial real estate comprising of hotels, resorts, apartments, old age homes and educational institutions. In 2003, Dr. Chaudhuri successfully established the first private medical school in West Bengal, India. On a sprawling 25 acres state-of-the-art campus with more than 1.8 million sq. ft. of construction, the KPC Medical College & Hospital, Shova Rani Nursing College and Paramedical College provide health and educational services to millions of Indians residing in the city of Kolkata. In April 2010, The KPC Group’s pharmaceutical company, Chemgen Pharma International, partnered with Ferrer Grupo based in Barcelona, Spain to develop The KPC-Ferrer Institute for Infectious and Tropical Diseases. The collaboration with Ferrer will combine and enhance the expertise of the two companies in the design of chemical compounds for developing anti-infective drugs. Also in 2010, Chemgen Pharma International, entered into an agreement with Orthopadietechnik KG in Germany to develop OrthoChemgen, a multi-million dollar company with bases in India and Germany. Dr. Chaudhuri’s Group along with Mobidough, Inc., created Swiftlythere.com, a mobile & web-based travel services company enabling virtual, “home-based” travel agents to book international & domestic air, car, cruise, hotel, custom packages, and group sales reservations at deep discounts with easy payment & ticket redemption technology. Dr. Chaudhuri and his Group are also involved in the Information Technology and Architectural/Engineering/Construction sector. In 2005, his Group created DowcoMAX Services to provide automated structural steel facilities to the worldwide steel market. DowcoMAX contributed to high-profile projects such as the Freedom Tower in New York City, the Goldman Sachs World Headquarter in New York, and many others including Oil and Gas refineries throughout the world. In 2011, Dr. Chaudhuri acquired DowcoMAX by enhancing his ownership position from 40% to 100% and renamed it ITeMAX Engineering Services. Dr. Chaudhuri is a driven leader who has derived his inspiration to build his dream from South Asian traditional culture, heritage and values. He has two children, Kali Priyo and Sumanta. Dr. Chaudhuri resides in Hemet, California with his wife Sunanda. Interested in our KPC Group real estate projects?